A yellow warning for snow is in place. A yellow warning for snow is in place across Northern Ireland. 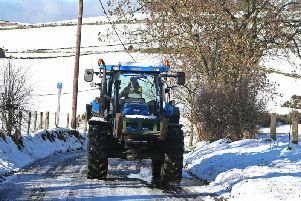 The Met Office alert, which affects all counties, comes amid flurries of snowfall overnight and into Monday morning. Motorists are advised to take care on the roads with icy conditions expected on many routes. Forecasters said: “Snow will fall to lower levels in places in Scotland and Northern Ireland, with localised accumulations of 2 to 6cm, while snow-cover will be more widespread over hills here, with around 10cm possible above around 400m, especially in the west. Traffic Watch said salting is underway across the network. “Motorists are advised to exercise extreme caution when travelling, particularly when driving on untreated roads,” the Department for Regional Development service warns. * Allow extra time for your journey. * Slow down and leave plenty of room to stop. You should allow at least three times more space than usual between you and the car in front of you. * Brake gently to avoid skidding. If your wheels start to lock, ease off the brakes. * Drive slowly on snow in the highest gear possible. * Never overtake snowploughs or gritting lorries. The drivers have limited visibility, and you’re likely to find the road in front of them worse than the road behind. * Do not assume your vehicle can handle all conditions. Even four-wheel drive vehicles can encounter trouble on winter roads.